Where’s your favorite taco truck spot? I totally understand if you don’t want to blow up the spot and spoil it but the way things are looking we might be taco truck-less soon. I don’t mind, so I’ll share the love. I’m not originally from Los Angeles so I only have my hood to go by and my favorite spot for sure is the Taco Zone truck posted up on Alvarado in front of Vons (Silverlake/Echo Park). You know how some spots might only be the move for a certain type of taco or has so so tacos but amazing salsa or vice versa? Well the zone for me, is the move for it all. Bonus is that its all women working in there. On the rare occasion my body craves red meat I gots to get into the zone, Taco Zone that is. This entry was posted in Food by Ritzy Periwinkle. Bookmark the permalink. There was this one truck on Cesar Chavez and Lorena (near Five Points) that was my salvation during my low income years – they would only charge me $1 for a torta sin carne. I think they moved down Lorena near First, I haven’t been there in awhile. There’s a truck on Figueroa near Ave 43 that can sometimes be good. I like Taco Zone too despite being a little pricier than other trucks. I love their crazy cooking pots and how you can watch them cook. 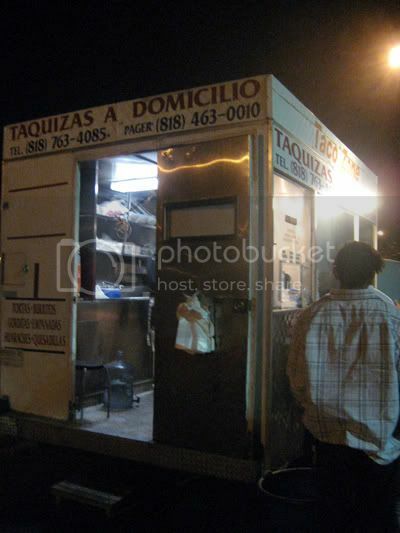 Technically, the best taco truck is the one that is nearby when you most need it! Soto and 7th, I’ll have to try. I’ve been disappointed by many a taco truck before until I found the Taco Zone. Before it was a gamble, now its a given that my craving will be satisfied. But we all know who makes the best soy tacos, right? Pleesebeleevit!! But I agree with El Chavo, “the best taco truck is the one that is nearby when you need it.” When I lived in D.C., some taco-starved friends and I heard a rumor of one across the street from Fort Myer in Arlington, VA. We hit lots of traffic and were starving by the time we got there. The tacos and Fresca drinks were exceptional! “Food of the Gods,” we declared. But that must have been because we were hungry. They didn’t taste good at all when we went back the next weekend. Good thing for Lauriol Plaza, the best carne asada you’ll find in on the East Coast! back in the day when I was a morro growing up, the best Taco truck place used to be in the corner of Compton Ave and Florence one block north of the Amapola. I’ve been to that Marisco truck on Olympic near soto. You can’t miss it, its always full of people, and the Mariscos are awesome. As far as tacos and tortas, the best I’ve had are located in the corner of Evergreen and Cesar Chavez. Here is a map, the taco truck doesn’t appear on the picture, because it’s only there at night. teck, love the visual, good looking out. Hey Teck, your right on the money for the truck on Evergreen and Chavez. I love going there and getting tacos with my dogs after walking around the cemetery. Best all around taco truck down here in Pedro parks in front of the True Value on Pacific, between 12th & 13th. They have the best al pastor & lengua. Chavo’s right – any port in a storm, IMHO. Marshall my uncle used to own that taco truck in front of True Value he now has two taco restaurants in Pedro, one on 13th and Gaffey on the corner and the other between 7th and 8th on Pacific. As for the Taco Zone I love that spot the chicken is pretty bomb, that is what i usually get yum but the asada is just as good. If i’m ever in San Pedro I’ll have to check out your tio’s spot. The truck at 2AM works for me. Al- My favorite all time truck is “Taco Loco” from 1980, in those days there were no silver dollar corn tortillas that many trucks now use!! “Taco Loco” used regular standard sized corn tortillas!! Tacos were juicy, tasty, and only .50 cents in those days!! They were so good that one time after a live performance at Rudy’s Pasta House,Earth Wind & Fire came out and had some tacos!! He would park on the North side of Olympic between Lito’s Cork Room, and the Pasta House!! Wow!! Earth Wind & Fire eating tacos in East LA!!! I love it!! I know 1980 IS a long time ago, but I have been around to many other trucks in East L A, but they don’t measure up to the legacy of El Taco Loco!